Given that I tested thirteen coolers total, and all of them with at least two different data sets, there's a lot of ground to cover. I don't want to produce too many oversized tables, so I'll break down all of the test results into two categories: closed loop coolers, and air coolers. 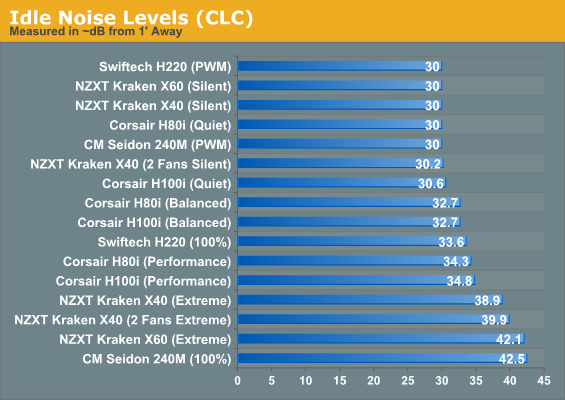 I'm also breaking down performance by load temperature, idle noise, and load noise. There's a lot of data to digest here. First, it looks like the very best air cooling has to offer is only really hugging the bottom of what closed loop cooling can do, but that's a bit deceptive. The breaking point is actually when you go beyond a 120mm radiator, and even then it's not certain: Noctua's new NH-U14S, at its fastest, is a better performer than Corsair's H100i at its quietest setting. 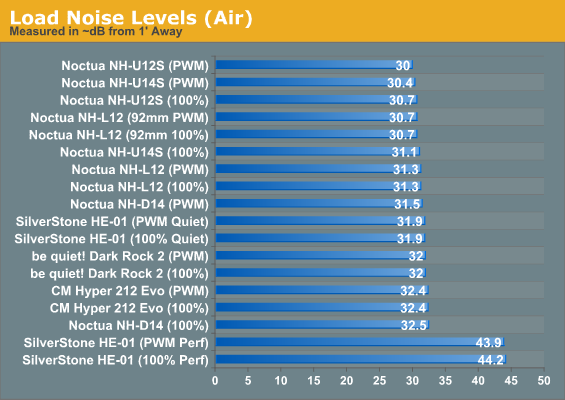 What's missing from the above chart is the noise the closed loop coolers have to generate in order to beat the air coolers; the only exceptionally loud air cooler is the underperforming SilverStone HE-01, as you'll see below. 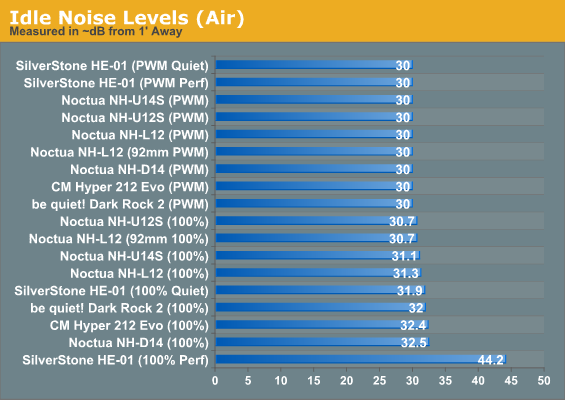 As you can see, the average idle noise on the air coolers is way, way lower than the closed loop units. 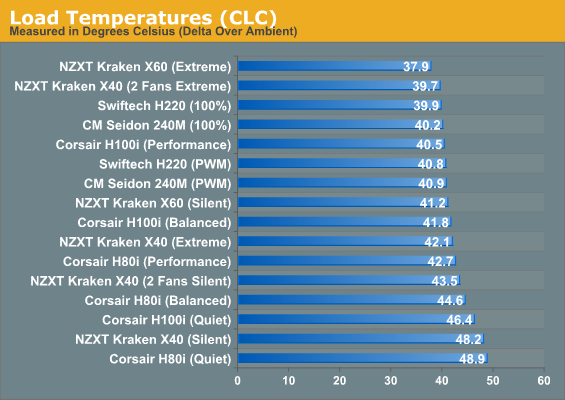 That suggests that liquid cooling isn't in and of itself a plainly superior solution outside of Swiftech's H220 and the 280mm NZXT Kraken X60. It gets better, though. Almost all of the air coolers are relatively silent under load, while the closed loop coolers produce a tremendous amount of racket if they're not configured for silent running. If you're like our own Dr. Ian Cutress and interested only with getting as much cooling performance as you can out of your cooler, then the NZXT Kraken X60 continues to be the best option. However, note that the Swiftech H220 was able to produce thermals just one or two degrees warmer while running 10dB quieter. 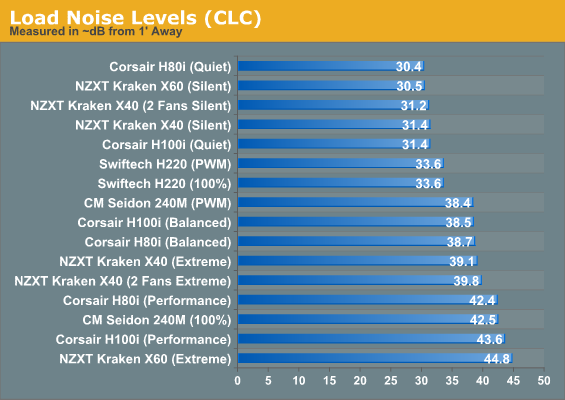 This is why some stores are having trouble keeping the H220 in stock: it's the best 240mm unit by a longshot, and it's even competitive with the beefier 280mm Kraken X60. 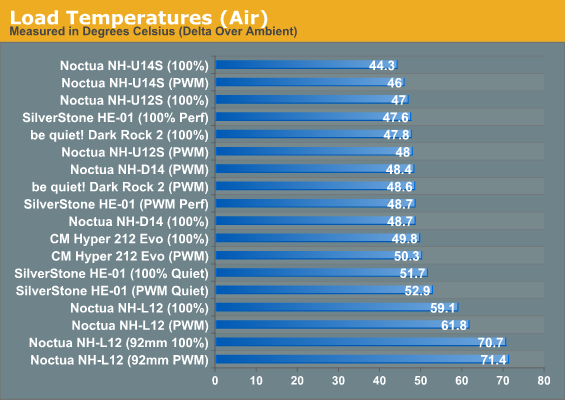 Also note that the two new Noctua coolers are meeting or beating their old standard, the NH-D14, and they're doing it while being quieter. The NH-D14 looks frankly overengineered compared to the NH-U12S. Finally, Cooler Master's Hyper 212 Evo continues to be a tremendous value, offering reasonably competitive thermals and noise for an air cooler at a fraction of the cost. really nice review with air cooler verse the water coolers . One comment though, looking at the air temps of PWM and 100% . They seem so close I would think you should get better results on 100% fan . Maybe the case still doesn't have good airflow for air coolers ? "You could do a nice xy diagram with noise and delta temp on the axes." I put one together for a prior cooler review; it wasn't nearly as useful as a I hoped. With very few exceptions everything bunched up in a fairly narrow diagonal line.